There’s something about being outside in the fresh mountain air that makes your mind and body continually look forward to that next meal. The summer offers many dining options from casual to gourmet. Crystal Mountain restaurants are open during the summer season from June 22 – September 16, 2018. Open daily for Breakfast, Lunch and Dinner. Walk across the bridge to this charming restaurant, rated #1 by Trip Advisor for restaurants near Mt. Rainier. The menu is created seasonally and inspired by local ingredients. Choose from indoor or patio seating and enjoy a meal to remember, accompanied by wonderful Northwest wines and microbrews and full bar service available. Sack lunches and take-out meals are available. Continental breakfast also available for hotel guests. Click here. Locals love the Snorting Elk Cellar, and it is an essential part of Crystal Mountain’s winter après ski scene. In fact, it’s received an honorable mention as the Best Ski Bar by Skiing Magazine. In the summer, drop by for a burger, big salad and a frosty microbrew after your day’s adventures. Hang out in the big lounge chairs and play a game of horseshoe toss in the meadows. Or try the disc golf hole. Takeout service is also available. Click here. 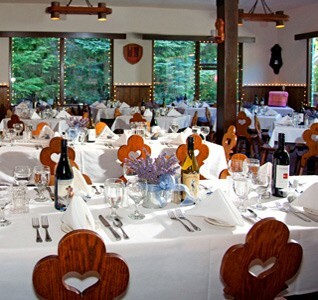 Dine at Washington’s highest restaurant, with gourmet Northwest cuisine and breathtaking views of Mt. Rainier and all the Cascades. The Summit House is open daily for lunch with extended hours on Saturday for early dinner. Access is via the Mt. Rainier Gondola. Click here. Found at the top of the master staircase in our base area, this walk-up cafe offers outdoor dining and a great selection of sandwiches, ice cream, espresso, beer & wine. Breakfast items available on Saturdays and Sundays. Enjoy the views of the surrounding peaks while you eat, and listen to the roaring sound of Silver Creek in the distance. Want to warm up? Grab a seat around the large outdoor fire pit. Click here. Located just 7 ½ miles from Crystal Mountain and just 1 mile outside the northeast entrance to Mt. Rainier National Park, Alta Crystal Resort’s small grocery store has everything you need for breakfast, lunch and dinner. Eggs, bacon, salads, vegetables, fruit, cereal, milk and a large selection of frozen dinner items including steaks, chicken and salmon. Beer and wine also available. Gourmet in-room “Heat and Eat” meals are also available for resort guests. Open 8:30 a.m. – 9:30 p.m. daily. The small town of Greenwater is located just 20 minutes from Crystal Mountain and has several places to grab a bite to eat. Greenwater restaurants are open year-round. Listed in Northwest Best Places, the “Cheez” is a favorite locals’ hangout. Lots of interesting local memorabilia, with burgers, chicken, salads, handmade milk shakes and prime rib Friday’s. Families welcome. Outdoor seating and full bar service available. Open 11 a.m. every day, with closing hours that vary based on the season. No website, but call 360-663-2267 for details. Locals love to stop by this place to say hi to Bob, Debbie and Jill, and to grab coffee, great muffins, breakfast sandwiches and ice cream. They have the best selection of Mt. Rainier apparel in the valley, so you can shop while you sip. THE place in the valley for gas, and a great place to stock up on groceries, beer & wine. They also carry an interesting selection of Greenwater souvenirs, and a practical selection of items for your camping trip. No website but call 360-663-2357. A great place to grab a snack or lunch while you’re exploring our favorite part of Mt. Rainier National Park. Burgers, salads, soups, desserts, chips, ice cream, hot chocolate and more. For 2018, they plan to be open from late June – September 4, plus selected weekends in September. Click here.